I am happy to help you achieve what you might have in mind. However, having to design from scratch or change any listing in any way to suit your needs takes quite a bit of time. To insure that the requester is serious about purchasing a custom sign and has a clear understanding of the time it takes in this design process, this custom design work will only be started once we have discussed the small details, sizing, fonts, etc., and I have received payment for the custom order request. Please keep in mind, I do not offer refunds for any reason. Please read all the details below. Could be a combination of Fonts, shapes, Frames, words/names on more than 1 line connected as 1 piece, etc., or the determination by me from your request that will substantiate longer than usual time. Below you will find all Custom Design listings. 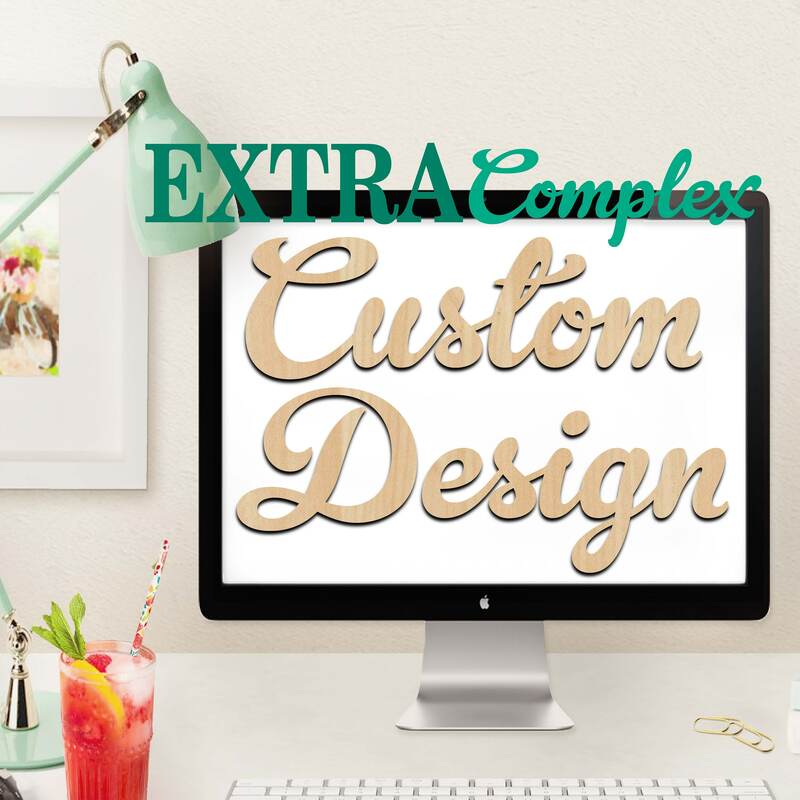 1)	A request for anything that I do not have listed or an alteration in something that I do have listed is considered a custom design. HOWEVER, if you are looking for a particular shape, please ask me if I have it, as I have many shapes that I don’t have listed (states, animals, miscellaneous objects), and I can just list that shape for you as a regularly priced listing. 2)	If you still need a custom design after reading No. 1, click on the “Ask a question” link in this listing. Describe to me in detail by words AND a sketch what you are looking for. This requires a bit of homework, a photo, and possibly research on YOUR part. c)	Objects you may want to include in the sign- Football, Ballerina, butterfly, panther, etc. I will need to know this information to know whether or not what you are wanting is within my abilities of what I can do and what I can find to complete your request. Once I get an idea from the above information, I will get back with you, and we can move forward. 3)	Once I give you the "Thumbs-up”, you will purchase this listing according to the size of the piece that you have in mind. The purchase price comes with an initial proof based on the information that you have provided in your original message and 2 Revisions if needed. 4)	When you submit back to me your revisions, make a list of what you want to be changed, AND also label/point out your desired changes on my latest revision (you can print out the image, mark on it in RED, and simply take a clear photo of your mark-ups to upload back into an Etsy Conversation of your order). 5)	It is very important that you supply all the information that I need in step 2 and 4 so that I can create your art work in the fewest number of revisions possible. If there is a need for more revisions, you can click on the listing below and purchase more revisions at $10 per Additional Revision. 6)	Once your payment has been made, no cancellations will be accepted. 7) Coupon Codes are not allowed on Custom Design work...this listing. 1)	The size of the piece is priced by the longest side. My table limitations are 48”x40”. 2)	I will start working on your revisions within 12-72 hours of you sending them back to me. How quickly you receive your order will be largely based on the number of revisions needed and your ability to respond quickly to my revision updates. 3)	Just so you know, I mostly do this design work in my spare time in the evenings. I have 2 very athletic boys, I work during the day, and we are a busy family in general. I ask that you prepare your thoughts and plan ahead of time (1-2 weeks) to give me time in this design process. Please do not expect your custom order ‘yesterday’. There will be times that I will not be able to complete revisions before 48 hours of you sending me back your revision list and sketches. 4) I do not give my phone number out. I'm sorry. I work during the day, and I can not take phone calls. That means you have to be as specific as possible to me through your words and hand-drawn sketches and photos. Fast Free Shipping...We ESTIMATE your purchase from final revision to door in 7 business days or less (see Shipping Policy #4 for details) for all items delivered within the continental US. YALL. This woman is INCREDIBLE. Besides being insanely talented, the shop owner is super helpful, nice, and freaking FAST!! Beyond impressed with the outcome!! Pure perfection!! I'm completely obsessed and could not be any happier! !